The other week I was trawling the internet as I usually do, researching a future blog post, when I stumbled upon a very familiar looking photo on Wikipedia. There was a good reason for that photo being familiar – I took it at Richmond station back on October 13, 2005. Over the past few years I’ve uploaded hundreds of my photos to Wikipedia – over 500 at last count – but the photo I found had been uploaded by someone else. 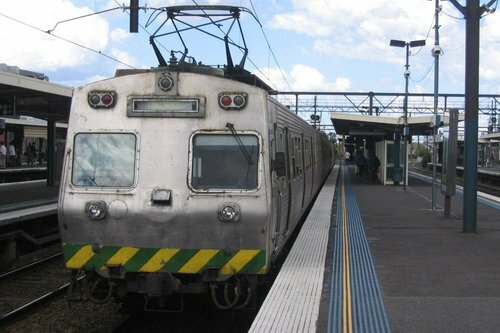 If pinching my photo isn’t enough, the thief had also gotten the date taken completely wrong – by October 2013 the remaining Hitachi fleet had all been stripped of the green and old ‘PTC’ livery when they received a minor refurbishment in 2007, followed by a Metro Trains sticker job in 2009. Rather than clean up the mess of copyright infringement, the simplest way to fix it was a deletion request – just navigate through the byzantine speedy deletion request page and it is deleted! 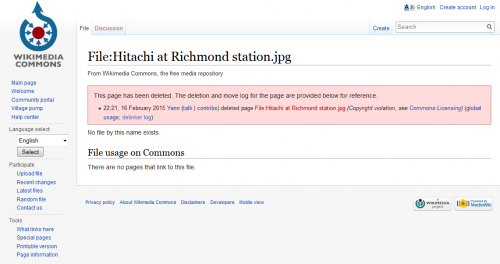 The bureaucratic processes of Wikipedia have been flagged as the biggest risks to the growth of the free encyclopaedia – both Slate and MIT Technology Review have written on the topic. This is a big problem across the entire internet, not just wikipedia. People no longer care about who owns a picture. The correct action of the user would be to contact the owner of the picture and request authority to use the picture on wikipedia. And I’ll bet you’d probably have given that authority if some link or credit were given back to you. Hey, the internet is full of click bait with stolen stuff. Stealing content is free, making content takes time and energy. Spot on there – it is one thing for people to do it out of ignorance, but click bait websites should really know better. Ironically one of my photos made it to Wikipedia via a request which I am otherwise happy to give. Another ended up on the front of the Dandenong Journal without request which also looked surprisingly familiar with the bottom bit blurred out slightly to remove the obvious arrangement of the cars – admittedly they do that with all their images at the top for headlines. I’ve been known to ask people for permission to use their photo on Wikipedia, and most of the time people are more than happy to. I see blog mates plastering their photos with their monikers. I don’t even know how to do it. People are so precious about their photos. As far as I know, no one has ever used a photo of mine without a request. Perhaps that says something about my photographic skills. But if they have used a photo of mine and not credited it, it could be that is was directly linked and they don’t actually know. If they have used as photo of mine as their own or without saying it wasn’t theirs, then that is wrong. I’ve used Wikipedia photos without a credit to who knows who took the photo. Wikipedia does not make it clear, more often than not. Clearly there is a an issue with Wikepedia and credits to photographers. I’ve never bothered with watermarking my photos – it make them look like dog balls, and if someone is determined to nick your photo, they will just crop them out anyway. 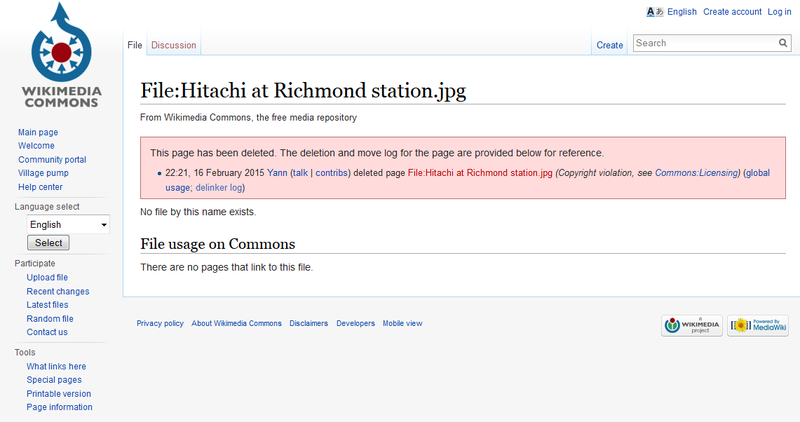 Reusing photos Wikipedia can be a tricky one – their list of requirements is long and convoluted! To find the author’s details, you need to dig down to the image description page, where it appears along with the licensing information.